Before answering the question, let's have a basic understanding of MTS video first. In brief, MTS format is a currently booming high-definition (HD) video format mainly applied in HD camcorder such as Sony, Canon, Panasonic and JVC. To be more specific, being a file extension for AVCHD (Advanced Video Coding High Definition) video, MTS generally adopts H.264 video coding and AC-3 audio coding, and supports 1080i and 720p, with full HD standard 1920 x 1080/1440 x 1080 for resolution. Why to Convert MTS Videos? Nowadays, it is usual to shoot some awesome video chips for a wonderful vacation, graduation ceremony, happy parties, weddings or other meaningful moments with the high definition camera. What making many people anxious is that the videos shot by HD camcorder are in MTS format, which cannot be directly played on Mac, not to mention iPhone, iPad, AppleTV. The question mentioned at the start is just one example. To help you out such dilemma, this article here will show you an easy solution to convert MTS to MOV, MKV, MP4, iPhone with 2019's best MTS video converter for Mac. When choosing the MTS file converter, freeware would be preferred usually by most of us, under the premise that it balances the converting ability, output video quality and converting speed well. 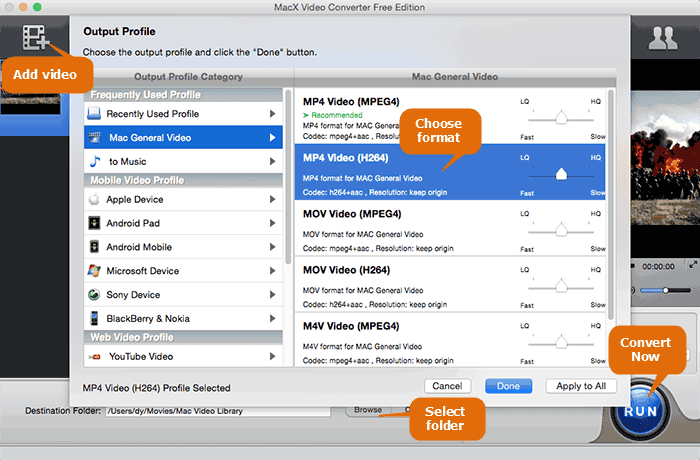 In this consideration, MacX Video Converter Free Edition would be a solid choice. This powerful yet easy-to-use free video converter for Mac offers you a smooth and enjoyable experience to convert MTS to MOV, MP4, AVI, iMovie, YouTube, iPad, iPod, iPhone, Apple TV, Blackberry with a few clicks on Mac, so that you can play the MTS/M2TS files on Mac, portable devices anywhere and anytime, edit via iMovie, or upload the video to YouTube to share with other people. MacX Video Converter Free Edition is well known for its simple navigation, satisfactory output quality and world's fastest speed. So you can complete converting MTS/M2TS HD videos on Mac within 4 simple steps shown below, without taking too much time. Step 1: Free download the MTS file converter on Mac first. Run it and click "Add File" button to browse your computer hard drive and select files you want to convert. Step 2: Choose the output format as you need. For example, you can choose converting MTS to MP4, MTS to MOV, M2TS to MOV, TS to MP4, etc. with stunning video quality. This 2019 MTS video transcoder also enables you to clip the file length, adjust the video bitrate, video resolution, frame rate, etc to get the best output effect, as well as capture favorite pictures from the original video in JPEG or BMP format to use them as wallpapers or share with friends. BTW, this free Mac video converter does more than converting MTS/M2TS AVCHD videos, but also transcode between HD and SD videos, such as AVI to MP4, MKV to AVI, FLV to H.264, VOB to MP4, MOV to MP4 on Mac etc. Step 4: Click the "RUN" button at the lower right corner of the interface to begin to convert MTS to AVI, Mac, MP4, MOV, YouTube and more. After the MTS conversion is finished, you can transfer the video to your desired output device for enjoyment. Extended information: For more video conversion, the advanced version MacX Video Converter Pro, could cater all of your need in video conversion on Mac, helping you not only convert a heap of SD and HD videos, such as AVI to MP4, MKV to AVI, VOB to MP4, MOV to MP4 on Mac, videos to iMovie, iTunes, iPad Pro, iPad mini 4, iPhone XS/XR/X/8/7/6s/Plus, Android, PSP, Zune and more, but also create VOB file from homemade or online videos so as to burn the video to DVD disc for memory or gifting to friends. It's the first and only media convertor supporting Intel's Quick Sync Video technology. That's to say, you can convert MTS video files in a few seconds, up to 5X times faster than other converters. Plus, its HD YouTube downloading feature can let you download YouTube video to your gadgets for offline enjoyment. Want to convert MTS to MP4 on Mac? Here easiest way to convert MTS files to MP4 format with a top MTS video converter is presented for you so that you can play MTS videos on Mac, iPhone, iPad, iPod, Android, etc. as you like. Wanna seek for the best M2TS converter for Mac? This article will share with you the best M2TS Mac converter to compress and convert M2TS to MP4 MOV MKV AVI MP3, etc. on Mac OS. Convert MTS and import MTS to iMovie in MP4 MOV M4V video format being simple now with a professional MTS to iMovie converter. MacX Video Converter Free is the best free MTS video converter for Mac with top quality and super fast speed. The feature-rich video converter helps you easily download HD or SD videos from YouTube, Vevo and more 300+ sites.